The Connecticut State Library at Hartford has many different databases but one very important represents the 100th anniversary of the United States’s entrance into ‘the Great War’ (WW One) in April 1917. The database has nearly 13,000 records for men who served, not just from Connecticut but also neighboring states. It is organized by the counties they listed they were from in Connecticut. It provides the person’s full name, if they served overseas (such as in France) and the box number where additional records on this person are available in the Connecticut State Library. If by chance there is a photo of the soldier in their archive that is noted. It is not just men who are listed, there are also some ladies who served as a nurse or phone operator for the military in the database. If a name is located go to the overall search box for the Connecticut State Library digital collections to place the name (could just try the surname) and see what else is available in their archives, covering other time periods. 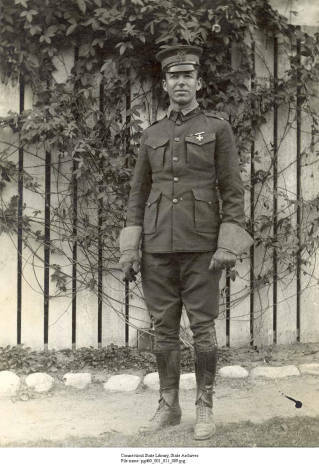 So not every detail about any WW One ancestor who served from Connecticut during 1917-1919 but at least a name to confirm they did serve. Photos: Conn. Soldier Lt. Leighton Powell; and listing of some WW One soldiers.